Jace tells him about his campaigning with Steve. Stresses he told him everyone in the house calls him GEEK SQUAD MCGEE. Austin says Clay and Shelli came up to him and Vanessa and said they really want to work with them and are willing to vote to keep JAce to prove loyalty. Austin tested out Clay and found out he leaked it to Jeff. He talked to jeff and now they are working together. .
Austin brings up Clay leaking what he told him. Austin tells him he guarantees Sheli and Clay are going to throw HOH because they are working both sides of the house. Talking about Clay and Sheli, how Sheli is the one getting weird about stuff. Jeff tells him he can pull James out of the big alliance and into theirs. Austin asks if they can get Meg out of the big alliance. Austin says they leave Clay alone and play them and if they have to they’ll take them out. Jeff telling Clay he’s all for jumping ship and calling a meeting of a new alliance but wait until after the HOH. Jeff says they can get James he’s loyal. They mention how Audrey was saying there was a Black Alliance with Becky, Clay, Sheli and Austin. 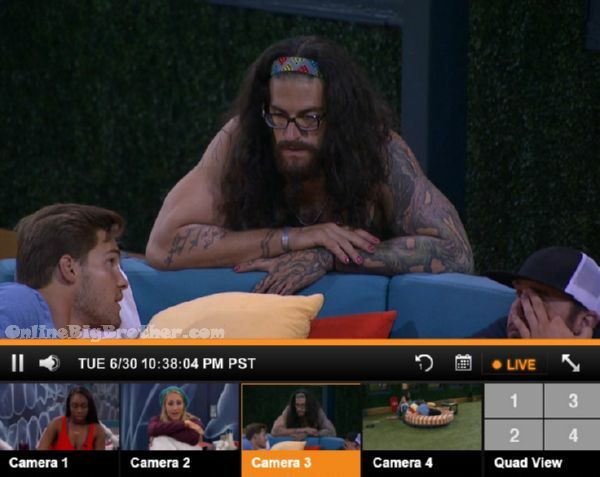 They tell Austin they might run their other alliance until it crumbles. Austin is worried that will put him in danger because once james he’s gone he’s a target. Jeff trusts Meg more than liz. Clay thinks Liz will be better at competitions. Clay suspects that JAson knows something is up he commented that Jeff’s been talking a lot with Austin and liz. Austin saying Audrey is up to it again spreading that there was a black alliance with Becky, Clay, Shelli and Austin. Austin says Jace went hard on Steve campaigning said everyone “up there” was calling him names. Jeff asks him why are things coming to him from Austin when they were supposed to come from Clay. Clay says Audrey was trying to form an alliance with Austin, VAnessa, shelli , Clay . Clay has been thinking about bringing Jeff into an alliance with him Shelli, Austin and Vanessa. Jeff says they need to start regulating what their people say because they been running around like sketch balls. Jeff is pissed that he’s learning things from Austin instead of Clay. Clay promises him he has Jeff’s best intentions in mind. they Dude out saying they shook each others hands. Jeff saying they should float with the alliance they got. He really doesn’t see Jason and Day turning on them right now. Jeff thinks they have a good thing going. Clay says Vanessa is with Austin. Meg is worried about the numbers they are losing Audrey next week. Meg says she doesn’t trust Becky thinks she’s a lot smarter than letting on. Clay would rather keep JAckie over Becky. Jeff says the question mark is Austin for him Clay syas for him it’s James. Jeff says they need a solid group of 5. 11:22pm In the bathroom the house is all a buzz about Audrey spreading the rumour of the black alliance. Comparing notes. Clay says people cannot keep anything secret you give them a bit of information and they share it. 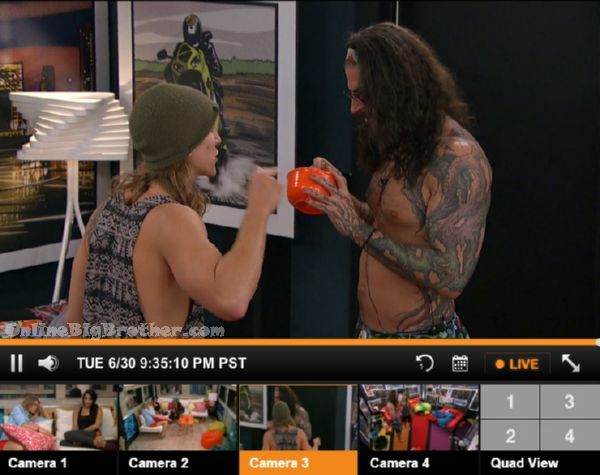 Shelli points out that Vanessa was saying Austin was sticking up for Clay today. She asks him if there is a guys alliance, Clay tells her no. Shelli noticed Jeff and Austin talking a lot today. She tells him he’s been making too many alliances in the house he’s making 3 or 4 it’s going to bite them in the end. Jeff joins them. Asks them about what they thought of Liz. Shelli says she’s flexible with her. She asks Jeff if he’s cool with Austin. Jeff says he is he’s trying to be. Jeff would rather trust Liz because Austin was the first one to squeal on his friends. They’re deciding they need to stick with a strong alliance. They want audrey gone this week and Day or Austin the following week . Audrey – yes they were.. like you walking around. .like before they would talk they would look under the couch to see if you were there. Steve – so it’s 8 again.. we have one person from each side on the block. James and Audrey start to argue. James wants to know why she’s still spreading rumours. Audrey says all she’s done today was lay in bed. James is pissed that she told Jace about the plan to backdoor him. Audrey – I’m not saying it was rational; i’m not saying it was right it was an emotional impulse it’s happened. Audrey says there’s a pair in this house that took this as an opportunity to turn the house against her. JAmes asks why she’s been laying down all day. Audrey says there’s two people in the house that were be pathological to her. those two will validate each other. She was onto them and was witnessing things she didn’t like just she acted too late. Audrey says they are not thinking of things rational and separating reason from emotion. points out that they (DAY and Jason) act on impulse. Audrey adds that she pointed out her concerns with Day and Jason but never said I doubted James. Audrey – I’m pissed because i’m being set up .. my only agenda is to write all the wrongs. james – alright well.. i mean ,.. it is what it is.. honestly this is Big Brother I don’t know who’s telling the truth. Jeff/Austin/Clay is such an overdone trope in the BB game. As Jason predicted a group of guys always tries to form up and steamroll through the game. What’s worse is that they usually have girls like Shelli, Jackie, etc help them get to the end. Hopefully the plan backfires, and those three go out sooner rather than later (which already seems to be happening. Is Clay more loyal to Jeff or Austin? Austin to Clay or Jeff? Jeff to Clay or Austin?). I’m into pairings that most people don’t expect, like Da’Vonne and JohnnyMac. I saw those two talking game on BBAD, and got pretty excited. If those three (Clay/Austin/Jeff) are serious, then Vanessa is going to be at the bottom of that totem pole (did she miss season 12 where Britney foolishly went to the final 4 with three guys?). I’m still trying to decide if Vanessa is really on this “I’m so loyal” shenanigans. I don’t buy it. She seems like she’s trying to position herself in-between Clay/Shelli and Austin, with a secret deal with Audrey on the side. Who’s she’s really loyal to is becoming a mystery. I don’t think I can take much more of the word dude. How old areJeff and Austin? I’m 21, and I don’t think I’ve ever heard that many “dude’s” in the 3 years I’ve been at college. Hopefully that alliance crashes and burns. “I can’t quit you dude?” WTF You two hated each other, in fact I don’t think Austin likes Jeff personally considering the way he talks about women. And both still talk about the other to different people. I wonder if we’ll have a double eviction before jury begins. If Liz can make it to week 5, then an extra (17th HG, Julia) will enter the game, so I wonder if there will be 3 DE or just two with one being pre-jury. Steve please stay away from Audrey. She was the first person calling you creepy. Her game is ashes, people might as well let her hang around, and take her out around the time Aaryn or Amanda left. Jeff is an idiot, setting himself up to be the next Audrey. Jeff is an idiot, setting himself up to be the new Audrey. I hope Steve doesn’t fall into that name calling bull crappie Jace/Audrey is saying. Jace and Austin were calling him and everybody else the “nerd herd” way before anything. I’m really hoping for a Day, Steve, Jason, and JohnnyMac alliance. I feel like that could work really well. I hope Jason and Day when HoHs too because they aren’t scared of ANYBODY! I LOVE IT. This season looks like it will be great. These idiots don’t even trust themselves!!!! Every conversation includes some “I trust you 100%”s. If I have to keep telling you I trust you, you probably shouldn’t believe me because the minute you leave, I’m telling someone else you are “sketchy”. Its like they don’t understand the politics of BB! My head hurts from how many things are happening in just week 1. This is a very promising start…everyone seems to be switching their alliance every 5 minutes. Audrey is going to take a lot of the blame for the next couple weeks or however long production can keep her, but honestly Jeff is just as bad. both of them talk way too much even when they aren’t trying to spread a rumor. it just seems like there isn’t a really good plan, they are all just abandoning ship left and right and this is when we already have the 2 people set on the block. just too many people in the house, I almost wish they just rocked the boat and went with a double eviction right out the gate. This season is already so much more entertaining than last season! Jeff is a tool. Clay has no clue how to play Big Brother. Austin is a lot smarter than people think & I hope he goes far. He’s by far the most trustworthy out of those 3.
so far I’ve been comparing what is going on in updates and feed to what is being aired in episodes. episodes have two small alliances (three girl alliance, shelltown) with a four person backdoor jace plot. unless a lot of DeLorean Flux Capacitor moments happen on the episode tonight, most of the people making alliances on both sides of the line will be a non-entity to episode viewers. hoh and nominees are expected to get a lot of d/r time; beyond those people, a lot of reaction focus in d/r has been given to da’vonne, meg and Audrey. Since the production storyline has a lot to do with determining how the predetermined twists will be implemented, I get the feeling that something Audrey beneficial will occur in the next week. Sure, a great deal is happening on feeds (more than in most week ones), but the almost separate entity that is the edited episodes is really downplaying or denying the existence of most of the shenanigans with free golden edits. unless the edit gets less restrictive tonight, i’m getting the feeling that this will be one of the seasons where episode only viewers won’t understand why feeders dislike certain houseguests. Day is a loud mouth beeotch and I can’t wait for her to go home. That is all. Go Jeff, Austin, and Clay!! I’m already sick of listening to the dainty flower feminists on this site whine and cry, I want to hear them suffer as those three MEN steamroll the rest of the house! !